Nestled between boulders and age-old Tamboti trees, the only thing disturbing your perfect private bubble bath in the Madikwe Reserve will be some ellies strolling along. Enjoy an al fresco bath overlooking the oldest desert in the world… Sink into the suds as dusk falls and watch a billion twinkling stars emerge over the never-ending desert landscape. Magical. Each of the five luxury suites at Baines Camp includes a magnificent outdoor bathtub, allowing you to stargaze and soap up at the same time. After a long day of tracking the Big Five on horseback, sink into a bath under the blue sky, or the stars, and listen to the sounds of the South African bush. Not only do these suites have some of the best bathtubs in the whole of Africa, they each come with a private heated swimming pool. To swim or to bath? It is a difficult toss-up. After a long day of wine-tasting and gourmet-lunching, what could be better than coming back to your lovingly-restored cottage, flopping straight into the bath overlooking the 8 acres of enchanting gardens at Babylonstoren? 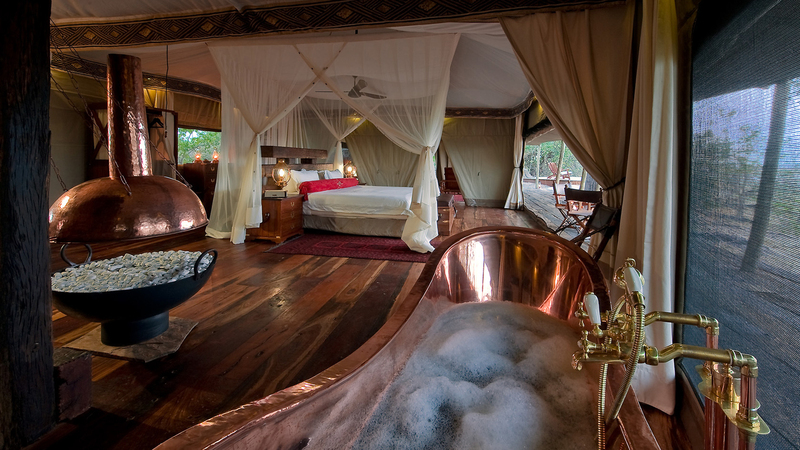 Stand-alone copper baths at this 1920s style camp in the Okavango Delta make bath time truly magical. The camp itself offers sweeping views of Zibadianja Lagoon’s waters. As if the wonder of Victoria Falls wasn’t enough, Tongabezi’s bathtub allows to end your day with a relaxing one-of-a-kind bath while the mighty Zambezi River passes you by. Among all the beautiful baths with a view, we have to give some credit to this open air shower overlooking the Serengeti. Plan your trip May to July and you might just catch the herds of the Great Migration while showering. Hovering high above the Atlantic Ocean, the views from just about every corner of Ellerman House are jaw-droppingly brilliant, but looking at them from the bathtub is a real treat. Time your soak with nightfall, and watch as the sun sinks below the endless deep-blue horizon.